Maxstor’s tool cupboard benefits as economical cost solution for storing all types of tools, spares, day to day inventories in systematic order. All Hinged Door Cabinet can be arranged individually through easy use of partition and dividers. To maintain an efficient transparency the tool cupboards and hinged door cabinets has feature option of glass on door. Three way locking system is used for all tool cupboards hinged door cabinets. Maxstor’s Bin Cupboard and Hinged Door Cabinet with bins are suitable for storing plastic bins or metal on adjustable shelves. As Bin Cupboard and Hinged Door Cabinet with bins manufacturer in India, we are the first one to introduce it which is very useful not only in engineering sector but also in general stores. 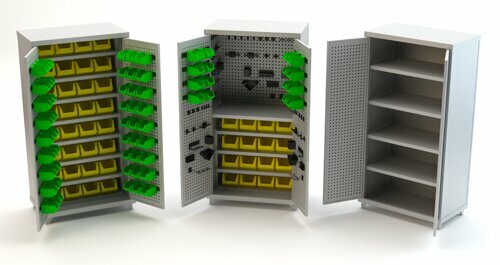 It helps in storing small parts and units in bins with clear arrangement. Maxstor is only a Perforation Cupboard manufacturer in India provide optimum storage options for all types of inventory on perforated panel placed on door and inside the cabinet. Perforated panels enable user friendly attachment of stored items due to a wide range of hooks. Maxstor is known as leader in Tool cupboard supplier and Industrial Tool Storage Cupboard supplier in India. This heavy-duty cupboard and cabinets are the ideally efficient for the storage of heavy items and materials in drawers. Drawer cupboard and hinged door cabinet with drawers are provide with heavy duty slider containing ball bearing. It has partition and divider for keep all item in systematic order. Maxstor as Tool cupboard manufacturer & supplier or hinged door cabinet manufacturer & supplier, we produce robust and rigid housing stability which is welded sheet steel construction supported with pillar, cross members and stiffeners. This Industrial Tool Storage Cupboard are available with 180° door opening. It has additional feature such as when the door is opened, it disappears outside the housing, providing optimum access to all stored items. In India such item are known with different name such as Tool cupboard, Hinged Door Cabinet, Industrial Cupboard, Drawer Cupboard, Bin Cupboard, Hinged Door Cabinet with bins and Perforation Cupboard. Three way locking system with 3 keys. Wide range of product with different dimensions for equipped with shelf/drawer/perforation configurations for any requirement. Drawers on heavy duty sliders with ball bear having load baring capacity upto 100 kg UDL. Load carrying capacity of upto 100 kg per shelf and drawer.